The Games aren't over. They're just beginning. Against all odds, Katniss Everdeen has won the annual Hunger Games with fellow district tribute Peeta Mellark. But it was a victory won by defiance of the Capitol and their harsh rules. Katniss and Peeta should be happy. After all, they have just won for themselves and their families a life of safety and plenty. But there are rumors of rebellion among the subjects, and Katniss and Peeta, to their horror, are the faces of that rebellion. The Capitol is angry. The Capitol wants revenge. 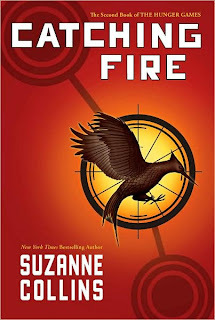 I read The Hunger Games about a week ago, and I was sure that this book wouldn't be as good. Regardless of how many times I was told otherwise, I couldn't believe that Collins could create another book of such epic proportions. Wow, was I wrong. If anything, Collins' writing improved in the second book. I was more in tune with the plot and characters than ever before. I got lost in the words and forgot where I was. There were times in school when the bell would ring, and I didn't even notice. Collins has a rare gift- her writing can appeal to all the senses. It is absolutely beautiful. As we all know, fans of this series usually choose a team: Team Peeta or Team Gale. I don't know how they do it! I can't possibly choose. I'm in love with all the characters. Katniss, the main character, is someone that I can really respect and admire. She's very realistic, as are all of the characters. You'd have to be quite the cold-hearted person to hate these characters. In the first book, the plot was mostly action. Katniss was simply trying to survive the games. In the sequel, there is much more to the story. Mystery, passion, suspense, and more action. Collins had me hanging on her every word. Nothing in this story is predictable. Now, I don't want to ruin the ending for anyone, but it was one of the most dramatic endings I've ever read. I'm DYING to read the next book! I don't think I can possibly wait until August. This series is one of my absolute favorites. I am recommending it to all of my friends and fellow book bloggers. This is definitely a book that you don't want to miss out on! Catching Fire earns five well-deserved hearts. I love this series as well! I also agree with you, it's so hard to choose between Peeta or Gale.I love both of them so I feel bad for Katniss having to choose between them.